A long time has passed since updating this blog with my RC-doings! There was a two week break in May, during which RC was not in session. I chose to skip the Never Graduate week reunion, which occurred over the first week of the break. The second week was mostly occupied with PyCon. 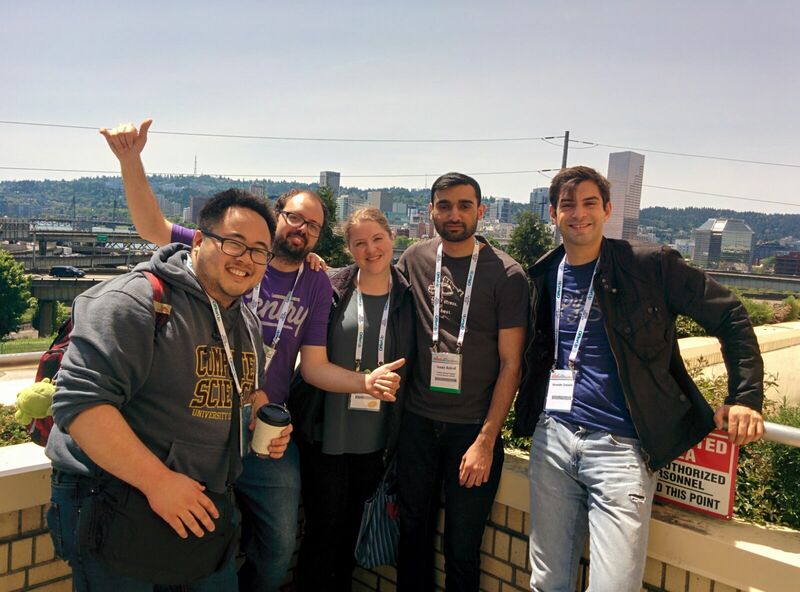 I traveled to Oregon to attend my first PyCon, and it was a wonderful experience. Over the break, I got a lot less done than I wanted to. But I wrapped up a few things, and started some new ones. ! !Con at the start of the break and PyCon at the end were amazing, and were where I spent a lot of my social energy. I watched a couple videos about concurrency in Python that got me interested in the subject, and I have to admit I’ve fallen down a bit of a rabbit hole! I’ve done a bit of passive learning about concurrency and async/await topics in Python, but my interest quickly split off into the Céu game I made as part of the recent game jam. Oh right, the game jam! I organized a RC Sprummer (Spring + Summer) Game Jam over the last week/weekend! I modeled it on my Ludum Dare experiences, and hoped people would invest about two days making a game. People seemed to enjoy it, and made very impressive and interesting games. For Recursers, you can see all the games made on the wiki page for Game Jams. My own game is detailed here. I had played around with the Python SDL2 stuff earlier last week before committing to working with Céu’s brand new SDL bindings. It was challenging and fun to work with such young technology. I tried to build some enthusiasm for the Game Jam was giving a quick presentation on the first day of the new batch. I have been nervous to do public speaking about code. I wanted to speak the first day because I remember my first day at RC concluding with some intimidating presentations by people in the former batch, and a few people in my batch, too! It made me anxious and created a lot of extra impostor syndrome. I hoped that by talking about something light in a casual way, that I’d bring some levity and set the bar at a more reasonable place for the new batch. Overcoming my technical public speaking fears is not something I’ve focused on heavily at RC, but it felt good to succeed, even at a very brief and fun talk. My book a week project was stalled the last few weeks. 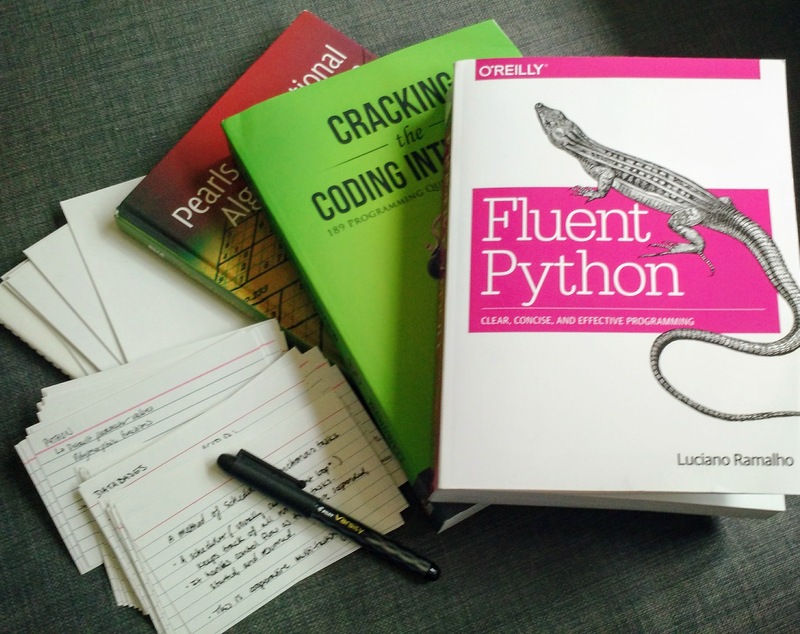 I’ve been busy reading, but “Fluent Python” by Luciano Ramalho has been long to get through. I’m finished now, though, and excited to get back on schedule. I got a lot out of the book, and look forward to it being a resource for a long time to come. I had a really great experience meeting the author, Luciano at PyCon, in fact. I mentioned I was reading the book, and he asked me how I was liking it. I was honest and said, “It is great, but long!” He was very sweet about it, and said if he was to do it all again, he might consider releasing the book as a series of 5 or 6 books. So by the author’s own count, I am more or less on schedule for a book a week! I also read some of “Pearls of Functional Algorithm Design” by Richard Bird, but abandoned it halfway. I might return to it when I am willing to invest more time per chapter, trying to implement the algorithmic coolness in Python. I’ve had a hard time adjusting back to RC life following the break. The demographics of the new batch make me pretty uncomfortable; RC is now about 20-25% female. The vibe has changed along with that, and is now more study-hall and less summer-camp. I miss the freewheeling social life and collaborative, safe environment that seems much diminished now, and the slightly competitive atmosphere is hard to manage for me. I’m hoping I can recover and make good friends with some of the new people, or at least find a way to put my head down and get lots of work done. Running lots of events and leaning on the staff and my friends has helped a bit.